t-72: 16h36 Le dernier passage dans Meilh Stang Vihan, seulement situé à un peu plus d'1 km de l'arrivée devrrait être décisif. Mellow Velo: Nobody getting close to Mullen's time. Mellow Velo: A TT on a dual carriageway. Yummy....................not. Leadbelly: did people go the wrong way? Leadbelly: "About 60 kms to go, the bunch is in total control of the situation. 1'45" for the six leaders"
The main ranking competition for the season and features elite men, U23 men, junior men and elite women. Formerly the Gazet van Antwerpen Trofee, the Bpost Trophee is the main belgian cross series. Held mostly around Antwerp it used to be raced on a points basis but in 2012/13 switched to a time basis. Any riders that do not start a race, fail to finish, or finish more than 5 minutes behind the winner, are automatically classified as finishing 5 minutes behind the race winner. Sven Nys is the king of cyclocross. Quite possibly the best crosser ever, the old man still continues to dominate the sport. He may not have the sprint some of his younger opponents have, but his technical skills and stamina are nearly unmatched. As ruling World Champion he will be looking to add even more wins to his palmares, which is already the most impressive of the sport. Niels Albert is Nys' most important challenger. Although particularly noted as the best sand riders in the peloton - he won the 2012 rainbow jersey on that strength - Albert can handle any kind of parcours. Even though he is not a sprinter, his tempo riding and running can drop even the strongest from his wheel. Albert dominated the rankinks last year, winning the World Cup and the Bpost Bank Trofee. The man from Tremolo will continue to look for wins in the coming season, and will surely take his share. Kevin Pauwels won 11 races and 2 classifications in the 2011-12 season, but could not replicate those results last year. Pauwels is smaller in build than his competitors, giving him the edge uphill. He is also a great sprinter and normally hard to beat in a sprint of a small group. If he can recapture his 2011-12 form this season, he will be a man to watch for any race. But even in last year's form he will gather some wins over the season. The Dutch champion and probably the biggest talent in the sport right now, Van der Haar is the only rider who can consistently rank amongst the Belgians. Last year he was not quite good enough to match Nys and Albert in the really tough races, but there is still plenty of room for improvement with this youngster. Van der Haar is technically good and has the best sprint in the field, but lacks some stamina to go all the way on the tougher courses. 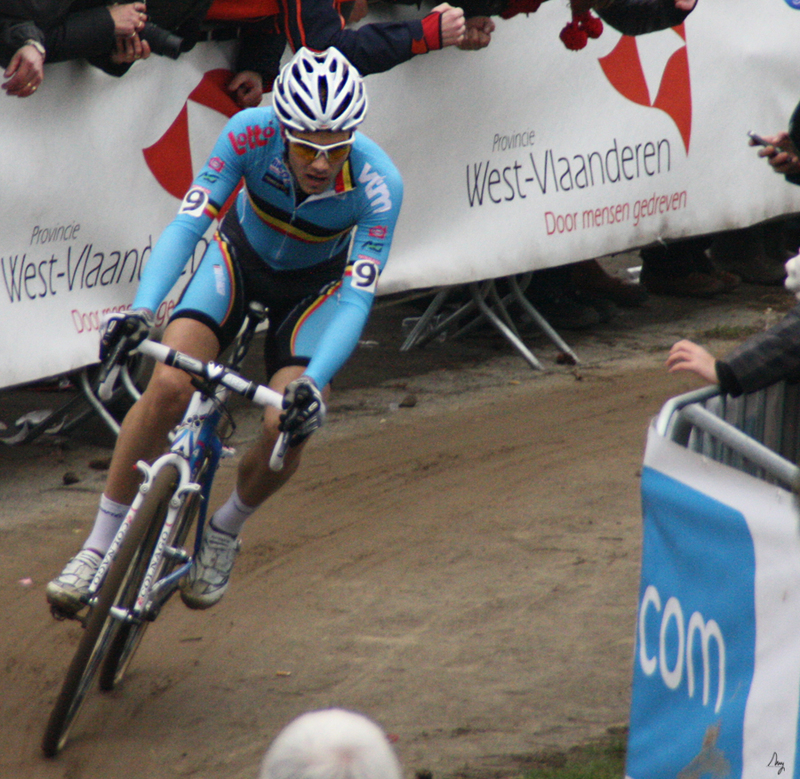 Klaas Vantornhout is the experienced teammate and often domestique of Kevin Pauwels. However, when he gets the chance to ride for himself, Vantornhout is a contender for the wins as well. He is the ruling Belgian champion, and a strong contender on any hard course. The tandem Pauwels-Vantornhout will be seen in many races this year, and form of the day may decide whether Vantornhout works for his captain or vice-versa. Tom Meeusen has been known as a talent for years, but has so far been unable to transfer that talent into results. Meeusen is the best technical rider on the field and can often be seen jumping over obstacles others have to dismount for. Furthermore, the youngster has a sprint many of his elders would be jealous of. Still, Meeusen's career has been marred with injuries, crashes, motivational problems and other setbacks. If he can overcome those problems, he could become a major player for the podiums. If not, he will continue in his current position: a good rider for the lower top-10 places, but little more. Another Belgian and teammate of Meeusen, Peeters is an eternal contender for the lower classifications but rarely for the wins. In fact, he has never won a race in one of the major competitions. He does have a Worlds medal to his name though, a second place in 2012. Peeters is a stable factor, but rarely a big-shot winner and seems likely to continue this into the new season. In cyclocross, there are often some prominent Czech riders next to the Belgians and Dutch. Simunek is often a contender for the top 10, but rarely wins any races. Martin Bina won one race last year, in Hoogerheide in cold and snowy conditions, but normally does not challenge for the win either. Stybar, of course is a different story. He is one of the best cyclocross riders in the world, but has changed his focus towards the road. If Stybar decides to compete in some cross races this winter, he could definitely challenge for the win there. And perhaps he could even inspire his compatriots to a Czech worlds victory? Mourey is one of the few French riders still active in cyclocross. The man often picks up some races in the US and his native France, but is rarely able to match the big names. His road performances this year were excellent though, particularly in the Giro d'Italia and the Tro Bro Léon, which he won. So perhaps this year Mourey can add some French spice to the Belgian stew that is cross racing? Some other names to watch: Bart Aernouts, Bart Wellens, Thijs van Amerongen, Twan van den Brand, Julien Taramarcaz, and Philipp Walsleben. Oh, and Jeremy Powers, even if just for his name. One of the hardest working cyclists around, not just in womens racing but throughout the sport. In 2012/13 as well as riding a road season she found time to enter no fewer than 37 cyclocross races on both sides of the Atlantic, nearly three times as many as Vos. While her palmares might not stand up so well to the other top ranked women (She won 1 Bpost event - finishing 2nd overall, podiumed in 2, and won the European Championships), her sheer workrate and consistency means she will always be right up there in the rankings. Five times Sanne has finished in the top ten of the World Championships, three times on the podium in the Dutch nationals, and runner up to Helen Wyman in the Europeans last year, Van Paassen is the young rider to watch this season. In 2013 she won a superprestige race for the third succesive year, and didnt finish outside the top 6 in the World Cup rounds. Five times world cyclocross champion, as well as road world champion, and multiple track champion, Vos needs absolutely no introduction. Only raced 13 times in cross last season, winning 10 of those races including three world cup rounds and the World Championships. Only a fool would bet against her becoming six time champion this year. Another youngster, who despite being only 23 years old is already four time Belgian Champion. Firmly cemented her place as the leading Belgian woman again in 2012/13 with 9 wins, including 2 Bpost Trophee wins, but a World Cup win eluded her. 2013 Will be a big season for Sanne.